Students who complete the required credits listed below will graduate from LHN with the Distinguished Level of Achievement. The requirements of this achievement are in compliance with the standards of the Texas Foundation High School Program, which is the minimum requirements set by the legislature and adopted by the Board of Education for all students in Texas to graduate from high school. 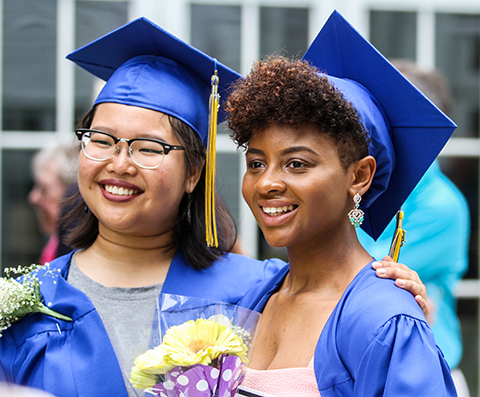 Our graduation requirements also include coursework to achieve the Multidisciplinary Endorsement: four credits of math including algebra 1, geometry, and algebra 2, and four credits of science including biology, chemistry, and physics. If a student is unable to complete the required coursework, we will work with the student and family to alter the graduation plan in order to meet the Foundation High School Program, either with or without an endorsement. This circumstance is rare and is handled on an individual basis. Students may also graduate with an additional one or two endorsements beyond the required Multidisciplinary Endorsement. They can choose to work toward the Arts & Humanities Endorsement and/or the STEM Endorsement. Students must complete four credits of math including Algebra 1, Geometry, and Algebra 2 and four credits of science, including Biology, Chemistry, and Physics. Interested in taking classes online? Students who are enrolled in LEAH Schools Online are required to complete the same number of credits to graduate. This applies to students who are enrolled full-time online and to those who have a blended schedule, which allows a maximum of four on-campus classes and a minimum of three online classes during each school year.